Say I have a mobile messaging app. There is a central server that manages stuff (like a directory of users, onboarding, etc.) and there are all the clients. My app is professional, so it uses asymmetric encryption to securely send messages. My question is, in short, should the client or the server generate the public-private key pair? If the client generates the pair, then the pair can be generated on the client-side and then sent to the server (maybe encrypted with the server's public key). So, which approach is better--should the client or the server generate the public-private key pair from a security perspective? Is there a better/more efficient/more secure way to do it than my solutions? It sounds like you're implementing server and clients. If you have that level of control, then generate client keys at the client because it's the right thing to do. should the client or the server generate the public-private key pair? If you want communication to be totally secure and only decryptable by the sender and receiver, then keys should be generated on, and never leave, the client. If the client is a Android or iOS app, then look into the Android Keystore or Apple Secure Enclave so that the client's keys are created in a separate processor and not even accessible to the app -- let alone the server. If you want the server to be able to read / archive / log / modify / wtv the messages, then the server needs a copy of all the private keys (or a protocol where each client encrypts for the server's keypair). At that point you give up all pretenses of privacy though. The method you have described where one party generates the key and sends it to the other is a well-used scheme. 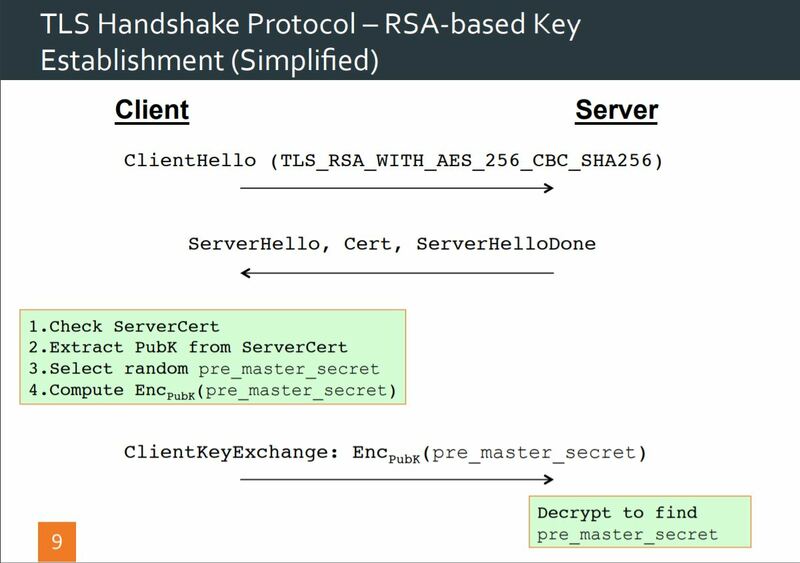 In fact, that's exactly how the RSA key establishment mode of TLS works where the client sends up a premaster secret to the server from which the session key is derived (slide borrowed from a Royal Holloway University of London summer school talk). Not the answer you're looking for? Browse other questions tagged encryption key-management rsa key-generation or ask your own question.